HoChuanWatch.com is the leading online retailer of today's most sought-after brand-name watches for men and women. 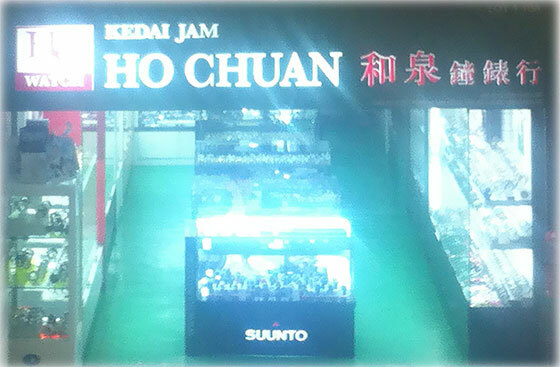 Since its inception in 1997, hochuanwatch (Perniagaan Kedai Jam Ho Chuan) has offered exceptional discounts on popular brand name watches from Citizen, Alba, Casio, Esprit, Guess, Nautica, Roscani, Seiko, Suunto, Victorinox and more. Today, hochuanwatch.com features over 1,000 different watch styles from today's most popular watch brands. HoChuanWatch.com has been in business for over 17 years and customer satisfaction remains our number one goal. Our success and longevity can be attributed to our loyal customers who shop with us again and again... and the friends they refer to us. HoChuanWatch.com is dedicated to offering our customers an extraordinary shopping experience with Free Domestic Shipping on all orders amount greater than RM500, 100% Satisfaction Guarantee and the Lowest Prices Guaranteed. Just choose the watch you want and add it to your shopping basket. Our checkout is simple, you may choose from local bank offline transfer or PayPal (credit card gateway support). At hochuanwatch.com, we source the top watch lines from manufacturers and distributors throughout the world, giving us the buying power to guarantee authentic, new watches, limited edition at the very lowest prices guaranteed. Our watches are genuine, authentic and new and we guarantee the watch you purchase from us is new,100% authentic.